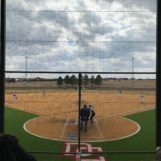 DODGE CITY, Kan. — It seemed as there would never be an ending to the doubleheader between Dodge City and Great Bend softball on Tuesday afternoon at Legends Park. The first game went 14 innings and took three hours to complete. Great Bend won that game 3-2, but the Lady Demons would bounce back in the night cap winning 5-4. Dodge City took a 1-0 lead in the bottom of the first inning on an RBI single for Caroline Stephenson that brought in Elise Helfrich. That would be the only run scored until the fourth inning when Great Bend tied it up at on apiece. Neither team would be able to execute with runners on for the next several innings, as both pitchers were dominant. Raegan Lopp for the Lady Demons and Shanaeia Mehlhaff for Great Bend were locked in a pitchers dual. Although each team had runners reach base, both left over a dozen runners stranded throughout the game. The game would head to extra innings with the game still tied at 1 after 7 innings complete. Great Bend pushed a run across in the ninth to go up 2-1 and put Dodge City down to their final three outs. Zabree Rodriguez came up clutch with a lead-off triple to right field. Lopp then hit a sacrifice fly to right to bring home Rodriguez and tie the game up at 2. Both teams were quiet for the next four innings, but that’s until the Panthers were able to grab a 3-2 lead in the top of the 14th inning. Dodge City was unable to get anything in the 14th, as Great Bend celebrated the hard fought victory. Dodge City’s Caroline Williams led off the third inning of the second game with a triple, followed by an RBI ground out from Helfrich to give the Lady Demons a 1-0 lead in the third. That wouldn’t be the only damage done in the third, as four more Red Demons came across in the inning to go up 5-0 after three. Great Bend grabbed one run in the fifth inning, as Dodge was still holding on to the four-run lead. The Lady Demons weren’t able to score in the fifth or sixth inning and led by four going to the top of the seventh inning. The Panthers got a rally going in the seventh inning and scored three runs to pull within 5-4 with two outs. Great Bend was able to get a double out to right field, but the throw in went off target. The Panther rounded second and was thinking about third, but that’s when Stephenson with a heads up play got the ball back and tagged the runner out to end the game. Dodge City is now 10-2 on the season and 2-2 in Western Athletic Conference play. Great Bend is now 6-4 and 3-1 in WAC action. The Lady Demons will be off until next Thursday when they travel to Ulysses for a non-league double header.